The following article was written by a Dutch comrade for the bulletin of the group 'Action and Thought'. It describes an action by South Wales striking miners in 1984 when they occupied three dock cranes at Port Talbot in an attempt to prevent the unloading of scab coal. An added 'Postscript' gives some indication of life in Maesteg 25 years later - a situation that is similar to many other former mining communities. To the memory of Charley White (1952-1985), the last president of the local lodge. In the September issue of 1984 I wrote an article on the British miners strike based upon some events in South Wales. This summer I revisited some of the miners because I wondered how they were since then and I want to write about it in this article. I will briefly go into the course of the strike until its end in march 1985, and I will pay more detailed attention to one particular action. After that I will try to depict the relations in the mine after the strike and finally tell about the struggle against the pit closure. I have dedicated this article to Charley White who died on December 1, 1985 - from the beginning of the strike Charley had been a stimulating and motivating power who was constantly active at picketing and at all other things that were important to the strike. Being a black man probably caused him many arrests by the police, very often for ridiculous reasons. In the struggle against pit closure, too, Charley displayed a ceaseless energy. Maybe that was too much for him: 27 days before the final pit closure he died of cerebral hemorrhage. Some miners were so much affected by his death, they could not attend his funeral. Though he did not live in Maesteg, he was buried there amongst his friends and colleagues who will never forget him nor the strike. The miners have put a stone on his grave in his honour. The whole year through the strike was characterised by secondary picketing (which by the way is not illegal as I erroneously wrote in September '94) and by collecting money and food. Since I have already told the most important things about that, I will restrict myself here to some examples. In a solidarity paper issued by union branches in Birmingham of June '84 some reports are given of meetings that were addressed by South Wales miners. The paper further writes that in a meeting of a branch of the Labour Party £75 was collected. It mentions food collections in Birmingham outside supermarkets on every Thursday and Friday evening and on Saturday afternoons. It announces a public meeting on "Women in the pit strike". The 50p. that is paid for tours in Sikh temples (a religion in India, From where many people emigrated to Great Britain) were given to the miners. A miner from St. John's wrote in this paper:"When we have meetings they got our view which is entirely different to the media. They walk out with a new outlook on the dispute and are grateful to us for having told them about the struggle that's going on. (...) we put cur case from the heart and get a better response even from people who are sympathetic anyway, than if the strike was discussed without anyone directly involved being there." By the way, I have been asked to thank very much the readers of Act and Thought who either directly or via the paper donated money. It amounted to £63.13. The article from September '84 has been translated and sent to Maesteg, so that the strikers could read what was written about them; the same will be done with this article. The solidarity from very many British workers as well as from workers from other countries has been tremendous, but the miners themselves have worked hard to achieve this. Secondary picketing was another feature of this strike. As has been mentioned, picketing at the pits in South Wales was not necessary, not until the end were there on a total number of some 19,500 strikers about 300 scabs. Because of the crazy amount of police and their very rough behavior, this form of action actually was not very effective. The convoys of lorries loaded with coal and iron ore that drove several times a day from the BSC-plant in Port Talbot to the works in Llanwern could not really be stopped. As a result of these experiences the following plan arose: if we cannot stop the lorries, we will make sure that the lorries cannot be loaded. In other words: some miners figured out a plan to occupy the cranes that are used to unload the coalships. Since I have been informed in detail by some participants on this drastic action, I can give a rather complete report of it. From about 15 pits around Port Talbot some men who could be trusted were asked and the action was thoroughly discussed. They looked for volunteers for "a radical action that may last a couple of days". From St. John's some 15 men volunteered. On Thursday the 29th of August at 22.30 h. they drove in 2 vans to Port Talbot, a distance of some 15 miles. At the old police station in Port Talbot - that was being used as a barracks for policemen who fought the picketers at BSC - they met the vans with workers from the other pits. At 3 mins. to eleven the 8 vans drove up to a gate of BSC. One guard came out of his box and said: "What's happening boys? Is this an invasion?" The moment he said that he realised what was going on and ran back to his box to give the alarm. One of the miners ran after him, grabbed him by his neck and swung him over his desk. He pulled all the wires of the switchboard and the wall, from the telephones and the electric water boiler, and crushed a walkie talkie. After 30 seconds the convoy drove ahead. Another guard, who had noticed something was going on, stepped on the road and jumped aside just in time (later, in court, he declared that a van had driven over his leg. But even a judge wouldn't believe that: a van with 12 men inside driving over one's leg with the leg [only] breaking was too an incredible story, he thought.) At full speed they passed along the offices where lots of policemen and dogs were also gathered. They had not yet been warned since the guard at the gate had been put out of action. Now, however, a general alarm was sounded. After arriving at the pier the miners parked the last car with flat tires on the road. The other vans raced on to the cranes. A lucky coincidence had put the three cranes together, ready to unload a ship. The crane-drivers fled immediately. In a big hurry the miners carried the supplies they had brought along upstairs (cans of food, water, walkie talkies, radio) and barricaded all possible accesses to the crane with barbed wire that they had also brought along. After this action, which was carefully prepared and very accurately carried out, 109 miners were 200 feet above the ground at 23.05 hr and they could study the whole situation. Why the cranes were standing together was quickly clear. Right underneath was The Argos, a Spanish ship that on its maiden trip had brought 90,000 tons of coal to Port Talbot. A good catch, indeed. In the meantime the police had come into action and cut off the electricity and they directed two big searchlights on the cranes. This could have easily blinded the miners with all the risks involved. The workers answered attempts to persuade them to give up by throwing down big poles that were on the cranes. This of course could not scare off Her Majesty's police force and they prepared to storm the cranes with the miners shouting and laughing at them. Once within "firing-range" the workers threw big bulbs, about the size of a rugby ball, at the police. In the panic caused by the exploding bulbs it was hard to see whether it was the the police pulling back the dogs or the other way around. After this the police kept at a distance. At night two workers sneaked out, after another worker had already withdrawn from the scene. This man had such fear of heights that it would have been irresponsible for him to stay in the cranes. The two strikers who went away in the middle of the night were on a special mission. They were to fetch extra food in case the action would [still] be going on on Monday. These two miners were sports divers who knew the neighbouring waters well and who had taken their equipment [to the action]. They managed to get away unnoticed. The next morning at Seven thirty the routine started that was to last for several days. One of the cranes had been made the 'canteen' and the first shift had its breakfast there. Between every two men there was a can of beans in tomato Sauce and of course tea, for which the empty can Served as a cup. At eight o'clock the second shift had breakfast and the third at eight thirty, The rest of the time was spent on guarding the cranes, keeping an eye on the police and fighting rain, cold, storm and boredom. Under normal circumstances the cranes are not being used at a wind speeds over 40 m.p.h., but the miners had to endure wind speeds of more than 70 m.p.h. (i.e., heavy storm). The crew of The Argos were very afraid and did not venture on deck. The ship was tight to the pier and could not sail. It was in serious danger however, since there was not enough water underneath the ship at low tide. Outside the harbour there were seven more ships waiting. Therefore it came as no surprise [to the miners] when they were ordered to leave by the High Courts. The normal procedure in handing over the order, however, could not be followed - for when somebody wanted to give the piece of paper to the miners they threw several things at him. The constable got away as fast as he could and then they told the miners on a megaphone to leave. Then the president of the South Wales NUM asked the men to stop the action, because they had reached their goal and he did not want them to go to jail. After heated discussions the occupiers decided after some time very reluctantly to cease the action. Sunday-evening at five thirty they left the cranes, dead tired but very proud for having carried out a very effective action. Before coming down they had made Some demands: a. - a luxurious meal from a first class restaurant; b. - decent treatment and no violence; c.- inspection of the cranes by the police and BSC only in the presence of representatives of the NUM. The Spanish crew of The Argos gave a big applause when the miners descended the stairs and split up in groups according to the participating mines. The police too showed respect for the action, not in the least because they couldn't believe their eyes when they saw how many workers were Involved. They had not counted an 106 men and so there were not enough police-vans. Since the local police station could not take such a big group, the workers were spread over villages in the neighbourhood, where their first demand was given in to. After having been in jail for 24 hours the miners returned home where they faced very angry housewives. They had been informed by the union immediately but they had been in great fears for 2 days and nights. In the court hearing, where great numbers of miners in the street Showed their solidarity in a loud voice, the prosecutor dropped several charges an the condition that the workers pleaded guilty to "Unlawful assembly". According to the original charges the workers were accused of having caused £10,000 damage to the cranes; cranes; the owner of The Argos claimed £30,000 damage and the workers were accused of assault. It is easy to guess why the prosecutor was so moderate. They didn't want to give too much publicity to the case since it might inspire other miners to similar actions. They probably also wanted to prevent such a big group of workers becoming martyrs. Whatever the reasons; the miners were condemned to a fine (that was paid by the NUM) and got two years probation. Yet there was a dark side to the whole matter. One of the men, a 19 year old miner, was so scared that he would have to go to jail for a long time, that he committed suicide before the trial took place. The strike itself ended just as sadly as the action at the cranes. On Tuesday March 7, 1985 all miners in South Wales went back to work; the strike had lasted a whole year but for two days. because the number of scabs were increasing more and more in the various striking areas, the decision had been made to a joint return to work. On Monday the 6th of march 100 miners returned to the pit enticed by extra bonuses by the National Coal Board, The majority however refused to become a scab at the last moment. At six thirty in the morning the 700 remaining strikers walked back to the pit under the union banner. Working conditions had deteriorated drastically and, in the middle of April 85 it quickly became clear that the NCB wanted to close down St. John's, although this pit had always been considered as a long life mine. In order to hasten the closure the management tried to provoke a strike by making it as hard as possible for the workers to dig coal. As a result of a strike the production quota for the rest of the year would be very low - and because the reason for that wouldn't appear in the books, it would seem that St. John's produced very little. Miners who dig coal while standing in water, normally got higher wages and were allowed shorter hours to give them time to get dry clothes on. This was abolished. Maintenance used to be carried out at night, but the management stopped that Shift. As a result the two remaining shifts only had some 2 hours to actually dig coal. A shift lasted seven hours and a quarter; over 2 hours were needed to walk to and from the face and from the remaining 5 hours a considable part now was lost on the necessary maintenance. Yet the miner managed to produce some 400 to 500 tons a shift compared to some 300 to 400 tons before. The miners worked so hard because they wanted to show that the mine was profitable, while they could also use the extra money after a year of bitter poverty. A completely different way in which the miners of St. John's tried to make sure that their pit stayed open was by organising a public inquiry where the advantages and disadvantages were thoroughly discussed. This public inquiry was used here for the first time as a means of action, at least in the nationalized coal industry. The action committee approached four experts, one of whom was Alan Fisher, a former president of the TUC. These four men thoroughly prepared the inquiry and listened to a lot of experts. The NCB refused to participate. I want to mention some conclusions from the report that resulted from this inquiry. According to moderate estimates there is over 4 million tons of high grade coal in St. John's, a quality that is very scarce in Great Britain. This means some 20 years of work for about 450 miners. Keeping the pit open would mean enormous savings for the government in unemployment money and the such. Further the skill and experience of the miners would be saved. At the end the report states: "... there is a powerful case for keeping St. John's open ... The coal is there, and a willing workforce to mine it; narrow commercial considerations indicate that the pit is far from being a lost cause; and it makes no sense to remove a major source of jobs from an area already suffering the adverse consequences of economic change when there are few alternative sources of employment." 1) Formally secondary picketing is not illegal indeed, but by means of a complicated set of laws and regulations it has been made practically impossible. First of all there is a legal prohibition of what is circumscribed as "violent" picketing. In the second place one of the "[anti] union laws" that were passed by the Thatcher government says that secondary picketing may not "disturb the public order" and that the police have the authority to determine to what extent the public order is being disturbed in concrete cases. If the police judge that secondary picketing is disturbing the public order, then picketing is for this reason "illegal". In the third place a company that feels itself being disadvantaged by secondary picketing can submit a complaint to a court, which then will forbid illegal picketing. For purely tactical reasons, in order not to push the matters to extremes, the NCB did not do so during the dispute. This, of course, does not alter anything on the matter of secondary picketing. 2) Not only from the Sikhs, but also from other people from Asia - the miners received much sympathy and also concrete support. Though neither the Sikhs, nor the other people are miners, some of them collected money and food at shops in Birmingham. From these groups individual donations came in from everyone from 6-year-olds to pensioners. Source; echanges (Echange et Mouvement) no. 47, November 1986, London. Note; A few grammatical corrections have been made to the original text. Boarded-up shops pockmarked Commercial Street which gently curves its way west towards the villages of Garth and Nantyfyllon. The Jobcentre Plus office was crowded but pubs like The Star and the King Alfred were empty. Having been populated since Bronze Age times it took off in the 19th century as an ironworking centre and in the 20th it became a coal town with more than 10,000 employed in pits. But in 1985, a year after the miners’ strike against pit closures began, its mainstay – St John’s Colliery – was shut down. Maesteg Town Council member Lynne Beedle, whose husband, father and brother worked at St John’s, yesterday said that since ... 1985 nothing has replaced coal as a major employer. She said: “I remember the 1984 strike well because my father was not on strike due to the fact he was an overman and was in the Nacods union. “Many of the pubs only open on weekends. We’ve been hit hard by the recession and Maesteg has become a dormitory town. “People go to work in the steelworks in Port Talbot or Ford in Bridgend or offices in Swansea or Cardiff, they don’t work in Maesteg any more." The mine opened in 1910 and provided Admiralty-grade steam coal from high quality seams which lined underground rock and sloped down towards the sea in Swansea Bay. Mr Jones said: “The pubs were thriving then, there must have been about 60 or 70 of them up here. You could hardly find room to get in. I was chairman of the Maesteg Workingman’s Club for years and it was a brilliant social scene but we’re having great trouble getting members now. A lot of the pubs have shut. 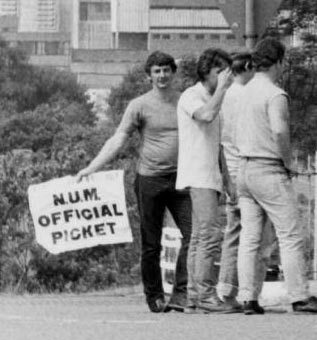 We went on strike in ’72 for wages and conditions and in ’84 it was to keep the pits going but it didn’t work. “I think Arthur Scargill used 1970s tactics for the 1980s and didn’t get away with it. Mrs Vincent said: “I was glad to see the pits close because it was hard down there and the miners earned every penny. Such sentiments are common in ex-mining towns - the pits have been grassed over and landscaped, the sense of community largely gone, sometimes replaced only by heroin epidemics and low wage jobs in call centres. All symptoms of a much larger historical defeat - in which the Miners Strike was a crucial battle. This article would be of great interest to those currently occupying open casting sites. Is it available as a pamphlet? No - this is probably the 1st time it's been published anywhere since 1986.